A Jesuit's journey of faith traveling alone on horseback lead the way for catholic families who were coming from the east to settle in southeast, Kansas. 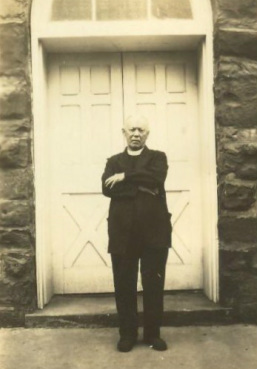 Although the area remote from any town or railroad, because of the church that Father Colleton built near Hickory Creek, it attracted many and quickly became a flourishing parish and school. Many priests have helped to make this parish rich in history. The following list provides a timeline of the pastors who served at St Aloysius Catholic Church at Greenbush. Bishop Mark Carroll and Father Herbert Moore. 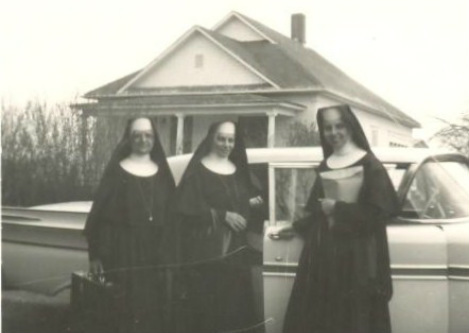 Sister Adorers of the Blood of Christ of Wichita taught at Greenbush from 1941 to 1961. Pictured above are Sister Esther or Lea from Rome, Sister Sophia and Sister Jean Marie. The first priest residence in Greenbush built by Xavier Lafouge in 1883. The structure was later replaced with a brick home.